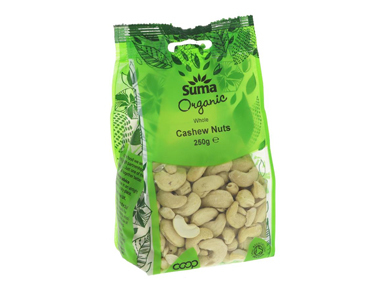 Buy Suma Organic Cashew Nuts (Cashews) 250 grams in the UK from our online shop or directly from our independent Scottish store. This recipe contains 200g of cashew nuts (Soaked overnight & drained). Delicious vegan chocolate with raspberries, which are in season from June until September. Or you can pick them in the wild! Gluten free cake, vegan cake! This recipe contains 50g cashew nuts. Where can you buy real Cashew Nuts 250g - Organic safely online? If you are wondering where you can buy Suma Organic Cashew Nuts (Cashews) 250 grams safely online in the UK, then shop with us. Cashew Nuts 250g - Organic - Suma Organic Cashew Nuts (Cashews) 250 grams in Nuts and Foods.